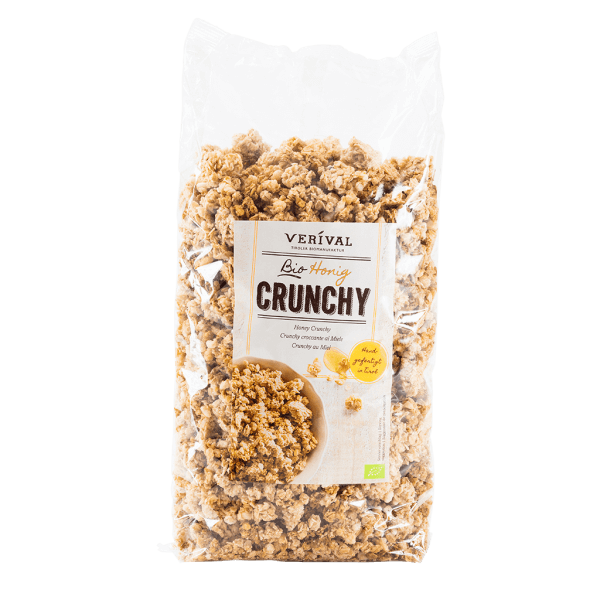 Crunchy clusters of oats and crisped rice, sweetened with honey, toasted with sunflower oil and mixed to perfection by hand in the Austrian Tyrol. Deliciously biscuity and purely organic. Good morning! Wholegrain oat flakes*, cane sugar*, high-oleic sunflower oil*, honey* 8,9%, wholegrain crisped rice*, sesame*, salt. > May contain traces of lupines, nuts and soy. Best enjoyed with fresh fruit, milk, yoghurt or quark – but also perfect on its own as a satisfying snack or nibble.